For the modern working woman with an old-Hollywood sensibility, this suit is a catch! Please scroll down to see images of The Hildy Johnson Suit modeled and in greater detail. We invite you to visit the link directly below, as well. Inspired by: His Girl Friday (1940). Materials: Knit with rayon lining. Closure: The jacket has 5 buttons along the front. The skirt has a side zipper with two hook-and-eye closures. Adorable pockets on the front of the jacket. While they have some depth, they are best for just hiding the fingers or holding something small, such as lipstick, rather than a phone. The front buttons seem to be slightly off center of one another when all are buttoned. Please see the images below. The inside bottom hem of the jacket is currently pinned. If you have a machine, this may be an easy fix and the pins are placed such that they cannot be seen when the jacket is worn. There is a 1/4" spot on the front of the skirt. There is a 1/8" hole on the front of the skirt. Fabulous cuffs on the jacket! Such a flattering style . . . and would lovely with blouse and open jacket. Worn by Kate. Blouse not included. Worn by Kate. Skirt only, blouse not included. Button detail on jacket. Notice how the buttons are slightly uneven. Jacket pocket detail, left side. 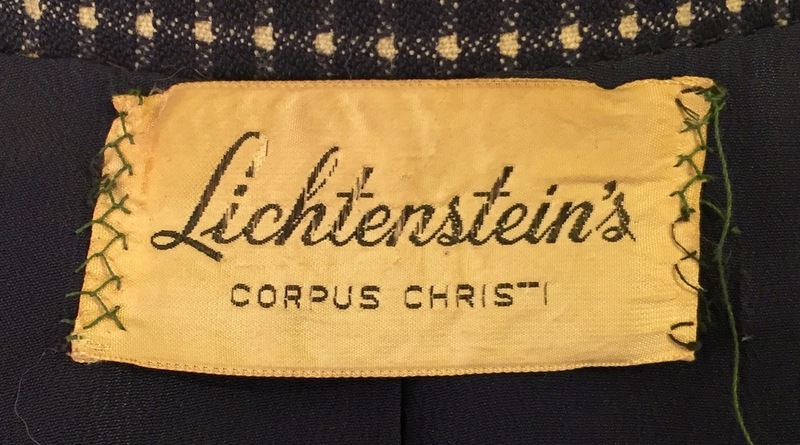 Label, sewn into the inside collar of the jacket. 1/4" spot on front of skirt. 1/8" hole on front of skirt.